A group of words or ideas having common meaning and is shared to a social situation is called language. Language is the entrance to a culture. Language is a set of socially sound pattern, words, and sentences having specific meaning and terminology common to the same culture. Language is a source of communication and to transmit message from one person to another. It is the method to mold the behavior and experience of a person. Language differs from culture to culture and is transmitted from one generation to another. Language is like a vehicle through which we can carry out our complex social activities. Language is the foundation of a culture and ticket to the entrance of a social life. Animal have not culture because they have no specific language to transmit worlds to others. So, language is the key to open a social life of an individual with some special characteristics. Culture is a system of symbols. Symbols are anything used to represent express and stand for an event situation. Symbols direct to guide our behavior. It is used to show an event of past, present or future. For example the heap of ash show that the something has been burnt or the wet street shows that it has rained. Bowing head, whistling, winkling of eyes situation, all are the symbols, which express a specific object idea about other. BaithUllah is the symbol of God and we pray to it. American Shake their hand to answer for No. Other examples are flag, anthem, picture, statues are symbols. Symbols are the short expression for the identification of an object or situation. a. Folkways. Folkways are the simple customary ways of the people. It is the normal and habitual action of people within a culture. Folkways are the recognized or accepted ways of behavior. These are the behavior pattern which a person use generally in his daily life. b. Mores. Mores is a Latin word and the plural of mos which means customs or beliefs accordance with a group customary expectation. It is the “must” behavior of a person. Mores refers to “what ought to be and what ought not to be.” Mores are serious norms but are informed like folkways. They have a serious binding on a group the violation of mores threats to social order. Punishment may be both formal and informal for the violation of mores. Anything getting importance in our daily life becomes our values. The origin of values is not biological but it is social production while living in society the values develop. Values depend upon the culture. Culture varies from society to society and thus values are different in every social situation. Values are what we like and what we say will in our society values are the good idea and thinking of a person. Some values are hereditary which we gain from our elders, books and parents. The culture is full of values and can transmit from one generation to another. When a natural object get a meaning it becomes a value. Every sect within a culture having some beliefs for cultural refuge. These beliefs are responsible fro the spiritual fulfillment of needs and wants. Muslims believe in God, Holly Prophet, The Day of Judgment, recitation of Holly Quran, Hajj etc. Sikh wear bangle in one hand, bear a long beard, keeping a dagger. Cross for Christians and a necklace or a cotton thread around nick, the water of ganga and are sacred for Hindus. 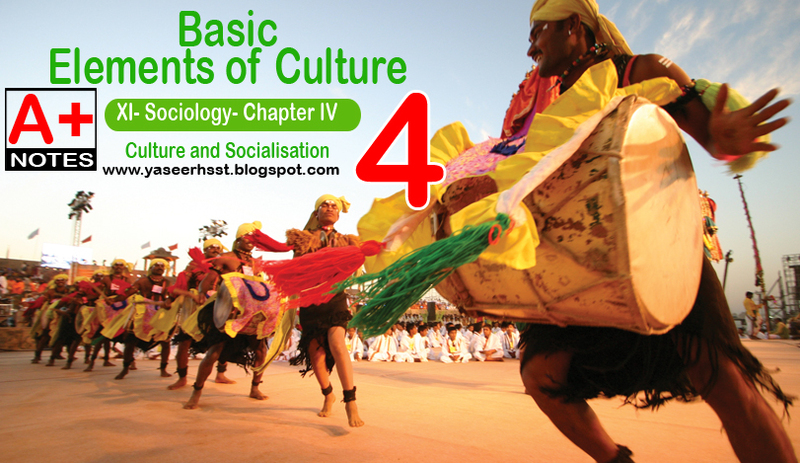 Cognitive elements of culture are those though which an individual know how to cope with an existing social situation. How to survive, how make shelter from storms and other natural calamities, how to travel and transport etc. are the practical knowledge which make a culture. Such knowledge is carefully thought to every generation.